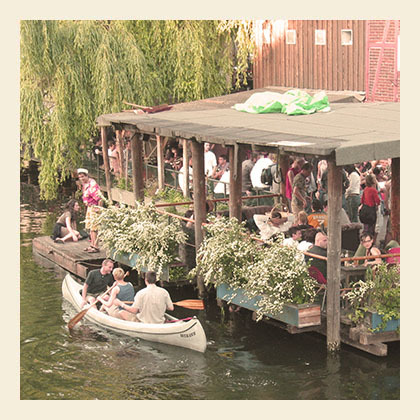 Berlin is surrounded by beautiful lakes and picturesque scenarios you wouldn’t expect. Go out and explore it by bike. Cycling is very easy, as all routs are clearly marked with signs. Please note that, you will need to buy an ABC ticket for most excursions, as well as an bike ticket.if you have any further question about the connections ask us at the reception. get the S-8 till Birkenwerder. in front of the station you will see signs to Briesetal. This is the one you want to follow all the way. You will pass some lakes on your way so don’t forget to take bathing suit along. In Borgsdorf you take the S-1 back to Berlin. follow either the blue hike signs or ask for Mühlenstrasse ( mill street). Once you found the mill, follow the red signs from there. On your way you will mainly cycle along the creek Briese. Once in Birkenwerder, catch the S-1 home from there. get the S-2 to Karow, then RB27 to Wandlitz. you will find 2 gorgeous lakes there, the Wandlitzsee and Liepnitzsee. South of Wandlitz lake you can explore the “Waldsiedlung” where GDR VIPs lived behind high fences to protect themselves from the proletarians. a quaint medieval spot with an almost complete surrounding wall. Follow Oranienburgerstr towards Wandlitz for 5 km. On your right you find the federation of trade unions school Bauhaus monument, later used by the SS and Gestapo to educate their pupils how to eliminate the former. from Strausberg follow the R1 bike signs towards Bockow. don’t wander if you see a pyramid on your way. Prussian generals had somewhat weird humour. In Buckow ride along the Scharmützel lake and follow Wriezenerstr.tonce in Grunow turn left to Klosterdorf, follow “tour Brandenburg” signs and after 3 km you will see S-Strausberg Nord. simply follow the “Spreeradweg” signs for 35km . A no-brainer for people who like forests and rivers. To get back, take the RE1 from Fürstenwalde. IMHO this is the 007 of all bike trips.Take ferry (yes!) from S-Wannsee to Kladow on the other side of Wannsee. there turn left and follow the only way there is all the way down to Heilandskirche, isn’t she pretty? Just like one in Venice. take the same way back and enjoy a Bratwurst in the beergarden while waiting for the ferry. an easy 8 km track from HBF in Potsdam to Caputh. A bike lane runs parallel to the road. in Caputh take the first left into Albert Einsteinstr and Bob’s your uncle. He spent his summer holidays here between 1929-1932. Caputh itself is a quaint little village as well, worth checking out. take the RB 22 to get back to Berlin. while Berlin was still a swamp with a doner kebap and a currywurst stand, Potsdam ruled half of Germany ( and a bit Poland, bits of Russia and some other places you might heard before). The city is definitely worth visiting if you are into places, parks, culture and arts. take a bike as there are just way too many things to see. Achtung: riding in parks is not allowed. Not really a day trip, unless you are a profesional rider. Doable in 2 days though. The Berlin Wall Trail traces the course of the former GDR border fortifications encircling West Berlin, the former western half of the city, along a total of around 160 kilometers. In most sections, this hiking and bike trail runs along the former patrol road used by customs officers in West Berlin or along the border control road used by GDR border troops for their own patrols.